Published in February 2019, I wrote this piece for Travel + Leisure about how to celebrate Mardi Gras outside the French Quarter. This DFW airport guide gives tips on dining, shopping, parking, transportation, and more. 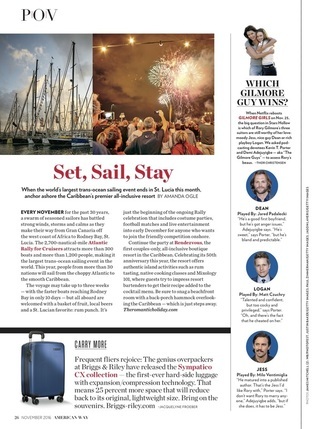 Published by Travel + Leisure in February 2019. This article for Travel + Leisure was published in December 2018 and discusses some of the best hot chocolates found around the world. This article for Adventure.com was published in December 2018 and discusses the Japanese practice of forest bathing, a meditative practice used for mental and physical restoration with an interesting history. This piece for Texas Lifestyle magazine tells about the Moxy Times Square, a boutique hotel in Manhattan. Published November 2018. I took a hot-air balloon ride through the desert of New Mexico and was able to help with the set up. Click the image to read about my experience at Travel + Leisure. Published October 2018. This piece in the October 2018 issue of Virtuoso Traveler discusses Franconian wine, which is only found in the Franconian region of Germany. Read a PDF version of the article by clicking on the photo, or read the full digital issue here. This article highlights some of the best wineries in Texas. Published August 2018 for Culture Trip. This article lists the best resorts in Texas. Published August 2018 for Culture Trip. This story for Culture Trip is about the best distilleries to visit in Texas. Published August 2018. 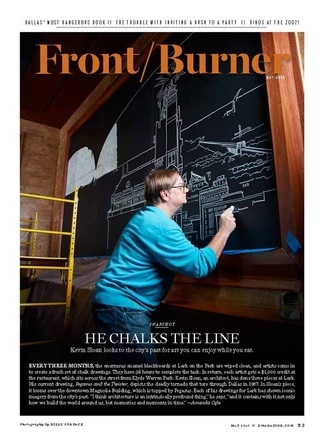 This article for Texas Lifestyle magazine is about Fort Worth's Clay Pigeon restaurant and includes and interview with its new executive chef. Published August 2018. Western swag, hipster vibes, and southern charm collide in Fort Worth, Texas. Here, a guide to spending a couple of days in Cowtown. Published July 2018 for Culture Trip. While it's smaller than other food truck parks, Fort Worth's food truck park is making a name for itself. Published July 2018 for Culture Trip. Located about an hour south of the DFW metroplex, Cleburne is a great small town to escape to for a weekend. Published July 2018 for Culture Trip. Everyone has their favorites. Here, some of the best barbecue spots in Texas Hill Country. Published July 2018 for Culture Trip. This article talks about some of the best zoos in Texas and what each has to offer. Published July 2018 for Culture Trip. ​This article discusses where to go on wildlife safaris in Texas. Published July 2018 for Culture Trip. In honor of National Tequila Day, this piece highlights some of the best margaritas to sample along Santa Fe's Margarita Trail. Published July 2018 for Culture Trip. This piece highlights Texas' national parks and National Park Service-protected sites. Published July 2018 for Culture Trip. Trek across Texas for some of the best pie you'll ever eat. Published July 2018 for Culture Trip. This story for Texas Lifestyle magazine focuses on the incredible food scene in Vail, Colorado. This piece was published in June 2018. Celebrate mosquito, watermelon, and more at these small-town festivals that draw big crowds. Published June 2018 for Culture Trip. Head down to the Texas coast and visit some of the best beaches in the state. Published June 2018 for Culture Trip. ​From kiddie splash pads to thrilling rides, a guide to the best water parks in Texas. Published June 2018 for Culture Trip. A roundup of the best state parks across Texas. Published in June 2018 for Culture Trip. This short article for A Sweat Life details a few of my recommendations for a healthy and active vacation to St. Lucia. This piece for Furthermore gives tips on how to spend two health-conscious days in a city praised for its glorious, sunny days. It was published in March 2018. This piece was published in the March 2018 issue of Texas Highways magazine. It highlights all of the special sites a traveler should visit on a weekend trip to the town. This article was published in the February 2018 issue of Virtuoso Traveler and gives readers a look into Uniworld's new Jewish heritage cruises and excursions. Cultural cruises are becoming more and more popular, and the sidebar gives info on other cruise lines offering cultural cruise trips. To read the full issue, click here. This article for Texas Highways magazine was published online in September 2017. For this piece, I talked with Big Bend Ranch State Park superintendent Nate Gold about what types of wildlife to watch for at the park during the fall season. He gives great tips on what to do in case of a bear or mountain lion encounter, too. This listicle went live online for Paste Magazine in May, 2017. Pod hotels -- tiny, functional rooms for travelers looking to spend less money yet still have functionality -- are popping up everywhere. I've rounded up some of the best from around the world to give your travels a little something extra. I wrote this story about dive eatery The Shed, located in Weatherford, Texas, for the March 2017 issue of Texas Highways magazine. The Shed is the best kept secret in town, and only open for lunch. The lines are totally worth the wait, and the connecting antique treasure chest of David's Stove Shop makes this destination a necessary stop during your travels. To read the online version, click on the photo. 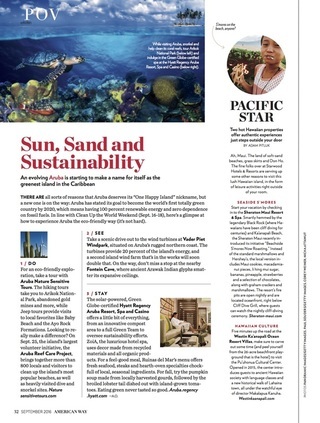 This short sidebar appears alongside a story about Mérida, Mexico in the January/February 2017 issue of Virtuoso Life. To read the full issue, click here. This piece about streets in Texas with great nightlife appeared in the January 2017 issue of Texas Highways magazine. To read the online version, click on the photo. This is my last piece as a staff member at American Way, and it appears in the November 2016 issue. I traveled to St. Lucia to learn about island culture and experience a small resort's 50th anniversary for this piece. To read the full issue, click here. This piece was in the September 2016 issue of American Way. I traveled to Aruba to write about all things sustainable in a place that is striving to become the first totally green Caribbean island by 2020. To read the full issue, click here. This story from the August 2016 issue of American Way is about the adult summer camp, Camp No Counselors. 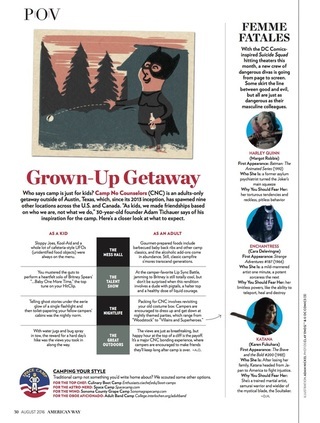 I attended a Camp No Counselors in Austin, Texas in order to write this fun piece. To read the full issue, click here. This is the Maps & Legends destination feature from the May 2016 issue of American Way. 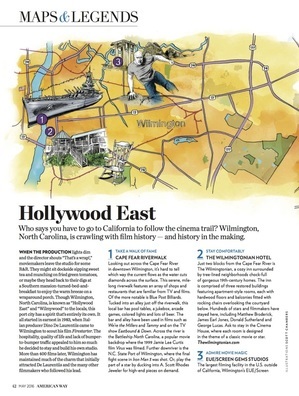 This piece features go-to spots in Wilmington, North Carolina to visit that have to do with the film industry. Wilmington is known as Hollywood East, as it has more than 400 film credits and the largest filming facility in the U.S. outside of California. To read the full issue, click here. This is a write up I did for D Magazine for the FrontBurner section of the May, 2015 issue.